Director Simon Clowes in LA: "The client, Bungie, was looking for an opening sequence to communicate a present day landing on Mars (500+ years before the setting of the game itself). We were asked to tell the story of that landing and the journey of the astronauts as they seek out a suspicious object hovering above the terrain – 'The Traveler'. "In order to realize film, which was to be fully CG, the entire world had to be designed from scratch – everything from the astronauts to the Mars environment, the weapons, and lunar module. "Since the sequence precedes the game by hundreds of years, it presented many challenging and exciting creative problems to solve since there were no assets provided and the characters were not in the game. "The hostile landscape of Mars was one of the most interesting and dramatic textures to work with. We wanted to turn it into a character itself and collaborated with concept artists to bring to life the chaotic terrain and environment through a series of matte paintings and projections. 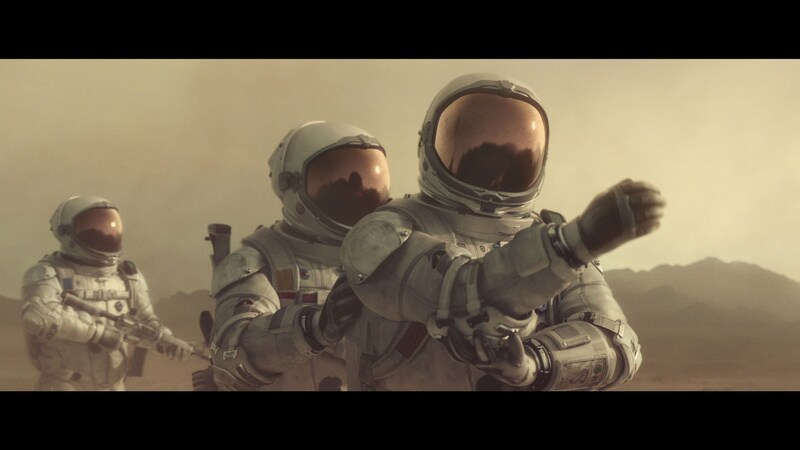 "The FX team was then tasked with creating the dust storms, and increasingly turbulent weather conditions, as the astronauts navigate the treacherous landscape. "Besides setting up a custom pipeline to handle the workflow, one of the biggest technical challenges was creating and refining the look of Mars itself. After researching available NASA imagery, it became clear that the terrain was not as intriguing as first thought.